The Burr conspiracy was a suspected treasonous cabal of planters, politicians, and army officers in the early 19th century. 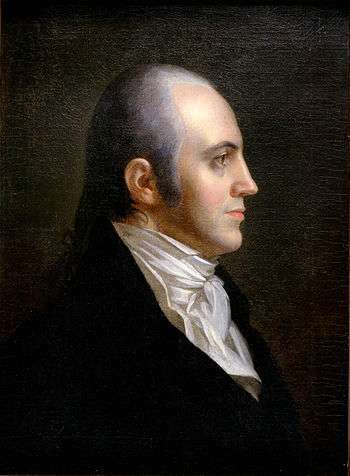 The cabal was allegedly led by Aaron Burr, the former Vice President of the United States (1801–1805); according to the accusations against him, Burr's goal was to create an independent country in the center of North America and/or the present-day Southwestern United States and parts of present-day Mexico. Burr's version was that he intended to take possession of, and farm, 40,000 acres (160 km2) in the Texas Territory leased to him by the Spanish Crown. President Thomas Jefferson ordered Burr arrested and indicted for treason, despite not providing firm evidence. Burr's true intentions remain unclear to historians, some of whom claim he intended to take parts of Texas and some or all of the Louisiana Purchase for himself. Burr was acquitted of treason, but the trial destroyed his already faltering political career. General James Wilkinson was one of Burr's key partners. The commanding General of the Army at the time, Wilkinson was known for his attempt to separate Kentucky and Tennessee from the union during the 1780s. Burr persuaded President Thomas Jefferson to appoint Wilkinson to the position of Governor of the Louisiana Territory in 1805. Wilkinson would later send a letter to Jefferson that he claimed was evidence of Burr's treason. While Burr was still Vice President, in 1804 he met with Anthony Merry, the British Minister to the United States. As Burr told several of his colleagues, he suggested to Merry that the British might regain power in the Southwest if they contributed guns and money to his expedition. Burr offered to detach Louisiana from the Union in exchange for a half a million dollars and a British fleet in the Gulf of Mexico. Merry wrote, "It is clear Mr. Burr... means to endeavour to be the instrument for effecting such a connection – he has told me that the inhabitants of Louisiana ... prefer having the protection and assistance of Great Britain." "Execution of their design is only delayed by the difficulty of obtaining previously an assurance of protection & assistance from some foreign power." In November 1805, Burr again met with Merry and asked for two or three ships of the line and money. Merry informed Burr that London had not yet responded to Burr's plans which he had forwarded the previous year. Merry gave him fifteen hundred dollars. Those Merry worked for in London expressed no interest in furthering an American secession. In the spring of 1806, Burr had his final meeting with Merry. In this meeting Merry informed Burr that still no response had been received from London. Burr told Merry, "with or without such support it certainly would be made very shortly." Merry was recalled to Britain on June 1, 1806. In 1805 Burr conceived plans to emigrate, which he claimed was for the purpose of taking possession of land in the Texas Territories leased to him by the Spanish (the lease was granted, and copies still exist). That year Burr traveled down the Ohio River starting in Pittsburgh to the Louisiana Territory. In the spring, Burr met with Harman Blennerhassett, who proved valuable in helping Burr further his plan. He provided friendship, support, and most importantly, access to the island which he owned on the Ohio River, about 2 miles (3 km) below what is now Parkersburg, West Virginia. In 1806, Blennerhassett offered to provide Burr with substantial financial support. Burr and his co-conspirators used this island as a storage space for men and supplies. Burr tried to recruit volunteers to enter Spanish territories. In New Orleans, he met with the Mexican associates, a group of criollos whose objective was to conquer Mexico. Burr was able to gain the support of New Orleans' Catholic bishop for his expedition into Mexico. Reports of Burr's plans first appeared in newspaper reports in August 1805, which suggested that Burr intended to raise a western army and "to form a separate government." In early 1806, Burr contacted the Spanish minister, Carlos Martínez de Irujo y Tacón, and told him that his plan was not just western secession, but the capture of Washington, D.C. Irujo wrote to his masters in Madrid about the coming "dismemberment of the colossal power which was growing at the very gates" of New Spain. Irujo gave Burr a few thousand dollars to get things started. The Spanish government in Madrid took no action. Following the events in Kentucky, Burr returned to the West later in 1806 to recruit more volunteers for a military expedition down the Mississippi River. He began using Blennerhassett Island in the Ohio River to store men and supplies. The Governor of Ohio grew suspicious of the activity there, and ordered the state militia to raid the island and seize all supplies. Blennerhassett escaped with one boat, and he met up with Burr at the operation's headquarters on the Cumberland River. With a significantly smaller force, the two headed down the Ohio to the Mississippi River and New Orleans. Wilkinson had vowed to supply troops at New Orleans, but he concluded that the conspiracy was bound to fail, and rather than providing troops, Wilkinson revealed Burr's plan to President Jefferson. In 1805 Joseph Hamilton Daveiss, the federal District Attorney for Kentucky, brought charges against Burr, claiming that he intended to make war with Mexico. With the help of his young attorney, Henry Clay, Burr was able to have the case dismissed. In December 1805, President Thomas Jefferson was anonymously informed that Burr "is meditating the overthrow of your administration". In February and March 1806, Daveiss wrote Jefferson several letters warning him that Burr planned to provoke a rebellion in Spanish-held parts of the West, in order to join them to areas in the Southwest and form an independent nation under his rule. Similar accusations were published against local Democratic-Republicans in the Frankfort, Kentucky newspaper Western World. Jefferson dismissed Daveiss's accusations against Burr, a Democratic-Republican, as politically motivated. "Yours postmarked 13th May is received. I have obtained funds, and have actually commenced the enterprise. Detachments from different points under different pretences will rendezvous on the Ohio, 1st November--everything internal and external favors views--protection of England is secured. T[ruxton] is gone to Jamaica to arrange with the admiral on that station, and will meet at the Mississippi--England---Navy of the United States are ready to join, and final orders are given to my friends and followers--it will be a host of choice spirits. Wilkinson shall be second to Burr only--Wilkinson shall dictate the rank and promotion of his officers. Burr will proceed westward 1st August, never to return: with him go his daughter--the husband will follow in October with a corps of worthies. Send forthwith an intelligent and confidential friend with whom Burr may confer. He shall return immediately with further interesting details--this is essential to concert and harmony of the movement. Send a list of all persons known to Wilkinson west of the mountains, who could be useful, with a note delineating their characters. Ny your messenger send me four or five of the commissions of your officers, which you can borrow under any pretence you please. They shall be returned faithfully. Already are orders to the contractor given to forward six months' provisions to points Wilkinson may name--this shall not be used until the last moment, and then under proper injunctions: the project is brought to the point so long desired: Burr guarantees the result with his life and honor--the lives, the honor and fortunes of hundreds, the best blood of our country. Burr's plan of operations is to move rapidly from the falls on the 15th of November, with the first five hundred or one thousand men, in light boats now constructing for that purpose--to be at Natchez between the 5th and 15th of December--then to meet Wilkinson--then to determine whether it will be expedient in the first instance to seize on or pass by Baton Rouge. On receipt of this send Burr an answer--draw on Burr for all expenses, &c. The people of the country to which we are going are prepared to receive us--their agents now with Burr say that if we will protect their religion, and will not subject them to a foreign power, that in three weeks all will be settled. The gods invite to glory and fortune--it remains to be seen whether we deserve the boon. The bearer of this goes express to you--he will hand a formal letter of introduction to you from Burr, a copy of which is hereunto subjoined. He is a man of inviolable honor and perfect discretion--formed to execute rather than project--capable of relating facts with fidelity, and incapable of relating them otherwise. He is thoroughly informed of the plans and intentions of Burr, and will disclose to you as far as you inquire, and no further--he has imbibed a reverence for your character, and may be embarrassed in your presence--put him at ease and he will satisfy you--29th July." In an attempt to preserve his good name, Wilkinson edited the letters. They had been sent to him in cypher, and he altered the letters to testify to his own innocence and Burr's guilt. He warned Jefferson that Burr was "meditating the overthrow of [his] administration" and "conspiring against the State." Jefferson alerted Congress of the plan, and ordered the arrest of anyone who conspired to attack Spanish territory. He warned authorities in the West to be aware of suspicious activities. Convinced of Burr's guilt, Jefferson ordered his arrest. Burr continued his excursion down the Mississippi with Blennerhassett and the small army of men which they had recruited in Ohio. They intended to reach New Orleans, but in Bayou Pierre, 30 miles north of Natchez, they learned that a bounty was out for Burr's capture. Burr and his men surrendered at Bayou Pierre, and Burr was taken into custody. 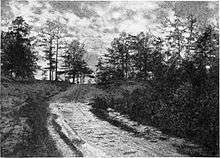 Charges were brought against him in the Mississippi Territory, but Burr escaped into the wilderness. He was recaptured on February 19, 1807, and was taken back to Virginia to stand trial. Burr was charged with treason because of the alleged conspiracy and stood trial in Richmond, Virginia. He was acquitted due to lack of evidence of treason, as Chief Justice Marshall did not consider conspiracy without actions sufficient for conviction. A Revolutionary War hero, U.S. Senator, New York State Attorney General and Assemblyman, and finally Vice President under Jefferson, Burr adamantly denied and vehemently resented all charges against his honor, his character or his patriotism. Burr was charged with treason for assembling an armed force to take New Orleans and separate the Western from the Atlantic states. He was also charged with high misdemeanor for sending a military expedition against territories belonging to Spain. George Hay, the prosecuting U.S. Attorney, compiled a list of over 140 witnesses, one of whom was Andrew Jackson. To encourage witnesses to cooperate with the prosecution, Thomas Jefferson gave Hay blank pardons containing Jefferson's signature and the discretion to issue them to all but "the grossest offenders"; Jefferson later amended these instructions to include even those the prosecution believed to be most culpable, if that meant the difference in convicting Burr. The case was controversial from the beginning. The high misdemeanor charge was dropped when the government was unable to prove that the expedition had been military in nature or directed toward Spanish territory. Burr's trial brought into question the ideas of executive privilege, state secrets privilege, and the independence of the executive. Burr's lawyers, including John Wickham, asked Chief Justice John Marshall to subpoena Jefferson, claiming that they needed documents from Jefferson to present their case accurately. Jefferson proclaimed that as President, he was "...Reserving the necessary right of the President of the U S to decide, independently of all other authority, what papers, coming to him as President, the public interests permit to be communicated, & to whom..." He insisted that all relevant papers had been made available, and that he was not subject to this writ because he held executive privilege. He also argued that he should not be subject to the commands of the judiciary, because the constitution guaranteed the executive branch's independence from the judicial branch. Marshall decided that the subpoena could be issued despite Jefferson's position of presidency. Though Marshall vowed to consider Jefferson's office and avoid "vexatious and unnecessary subpoenas," his ruling was significant because it suggested that, like all citizens, the President was subject to the law. Marshall had to consider the definition of treason and whether intent was sufficient for conviction, rather than action. Marshall ruled that because Burr had not committed an act of war, he could not be found guilty (see Ex parte Bollman); the First Amendment guaranteed Burr the right to voice opposition to the government. To merely suggest war or to engage in a conspiracy was not enough. To be convicted of treason, Marshall ruled, an overt act of participation must be proven with evidence. Intention to divide the union was not an overt act: "There must be an actual assembling of men for the treasonable purpose, to constitute a levying of war." Marshall further supported his decision by indicating that the Constitution stated that two witnesses must see the same overt act against the country. Marshall narrowly construed the definition of treason provided in Article III of the Constitution; he noted that the prosecution had failed to prove that Burr had committed an "overt act," as the Constitution required. As a result, the jury acquitted the defendant. The historians Andrew Burstein and Nancy Isenberg write that Burr "was not guilty of treason, nor was he ever convicted, because there was no evidence, not one credible piece of testimony, and the star witness for the prosecution had to admit that he had doctored a letter implicating Burr." In contrast, lawyer and author David O. Stewart concludes that Burr's intention included "acts that constituted the crime of treason, but that in the context of 1806, "the moral verdict is less clear." He points out that neither invasion of Spanish lands nor secession of American territory was considered treasonous by most Americans at the time, in view of the fluid boundaries of the American Southwest at that time, combined with the widespread expectation (shared by President Jefferson) that the United States might well divide into two nations. Burr, with his prospects for a political career quashed, left the United States for a self-imposed exile in Europe until 1811. He first travelled to England in 1808 in an attempt to gain support for a revolution in Mexico. He was ordered out of the country, so he travelled to France to ask for the support of Napoleon. He was denied and found himself too poor to pay his way home. Finally, in 1811, he was able to sail back to the United States on a French ship. Upon returning to the United States, he assumed the surname of "Edwards" and returned to New York to resume his law practice. He remarried, to the Eliza Jumel, the wealthy socialite widow of Stephen Jumel, but she left him after four months due to his land speculations reducing her finances. Historians attribute his self-imposed exile and using a different surname in part to escape from his creditors, as he was deeply in debt. Burr died on September 14, 1836, the same day that his divorce from his wife was granted. Following his involvement with Burr, James Wilkinson was twice investigated by Congress on issues related to the West. Following an unsuccessful court-martial ordered by President James Madison in 1811, he was allowed to return to his military command in New Orleans. During the War of 1812, he was posted to Canada where his only major offensive, a campaign against Montreal, was unsuccessful. He was discharged from active service. Wilkinson died in Mexico City on December 28, 1825. When the conspiracy was uncovered, Harman Blennerhassett's mansion and island were occupied and allegedly plundered by members of the Virginia Militia. He fled with his family, but he was twice arrested. The second time he was held in prison until the conclusion of Burr's trial, when the latter was acquitted. Blennerhassett went to Mississippi, where he became a cotton planter. Later he moved with his family to Canada, where he practiced law and lived in Montreal. Late in life, Blennerhassett left for England and died in Guernsey on February 2, 1831. ↑ Memoirs of Aaron Burr - Google Boeken. Books.google.com. Retrieved January 9, 2014. ↑ "Ciphered Letter of Aaron Burr to General James Wilkinson". Famous Trials. University of Missouri-Kansas City School of Law. ↑ "Special Message on the Burr Conspiracy". Special Reports to Congress. January 22, 1807. ↑ Pickett, Albert James (1900). History of Alabama and Incidentally of Georgia and Mississippi, from the Earliest Period. Webb Book Company. p. 492. Retrieved February 18, 2014. ↑ Stewart, David O. (2011). American Emperor: Aaron Burr's Challenge to Jefferson's America. New York, NY: Simon & Schuster. p. 233. ISBN 978-1-4391-5718-3. ↑ Jefferson, Thomas. "Thomas Jefferson to George Hay, 12 June 1807". University of Chicago. ↑ Newmyer, R. Kent (2007). John Marshall and the Heroic Age of the Supreme Court. LSU Press. pp. 199–200. ↑ Marshall, John. "Ex parte Bollman & Swartwout". The Founders' Constitution. The University of Chicago. Retrieved May 11, 2016. ↑ Burstein, Andrew; Isenberg, Nancy (January 4, 2011). "What Michele Bachmann doesn't know about history". Salon.com. 1 2 "Aaron Burr". Historic Valley Forge. National Center for the American Revolution/Valley Forge Historical Society. n.d. Retrieved January 23, 2012. ↑ "Joseph & James Wilkinson Marker". Historical Marker Database. November 11, 2007. Retrieved 2007-12-16. ↑ Ohio Archæological and Historical Quarterly. 1901. p. 119. "Aaron Burr and the Definition of Treason (1783–1815)." American Eras. 8 vols. Gale Research, 1997–1998. Student Resource Center. Thomson Gale. "The Aaron Burr Conspiracy (1800-1860)." American Eras. 8 vols. Gale Research, 1997–1998. Student Resource Center. Thomson Gale. Miscellaneous: Volume 1, Page 468, No. 217. Burr's Conspiracy. Miscellaneous: Volume 1, Page 478, No. 223. Burr's Conspiracy—his arrest. "Burr's Conspiracy, 1805-1807." DISCovering U.S. History. Online Edition. Gale, 2003. Student Resource Center. Thomson Gale. McCaleb, Walter Flavius. Aaron Burr Conspiracy: A History from Original and Hitherto Unused Sources. New York: Dodd, Mead, 1903. Philbrick, Francis S. The Rise of the West, 1754–1830. Ed. 1. New York: Harper & Row, 1965. Stewart, David O. "American Emperor: Aaron Burr's Challenge to Jefferson's America," New York: Simon & Schuster (2011).